The statements in the video below by David Starkey on the UK’s recovery from the Great Depression are of some interest. Before I get into criticisms, however, I may as well say that I do actually enjoy listening to David Starkey, and I find his brand of conservatism very interesting, even if I don’t agree with his economic analysis. All in all, he has a rather odd take on Britain’s response to the depression. Starkey says that “Britain recovered faster than any other major economy.” It was even – allegedly – a “miracle”! This “miracle” was achieved, so it seems, by budget cuts, welfare cuts and austerity, but at the same time by imposing tariffs and some housing construction. Now it is certainly true that Britain’s real GDP had recovered to its 1929 level by 1934. Britain did get some export-led growth in the 1930s after leaving the gold standard and devaluing its currency. They are the two main reasons why Britain had some degree of growth and recovery in the 1930s. It is also true that the UK, generally speaking, pursued a contractionary fiscal policy and austerity in the 1930s and shunned the kind of large-scale Keynesian stimulus that Keynes recommended (for the specialist literature, see Broadberry 1984; Middleton 1981; and Middleton 1984). But austerity was not a cause of the recovery. The most important metric we can appeal to in order to gauge just how successfully Britain in the 1930s recovered is unemployment. 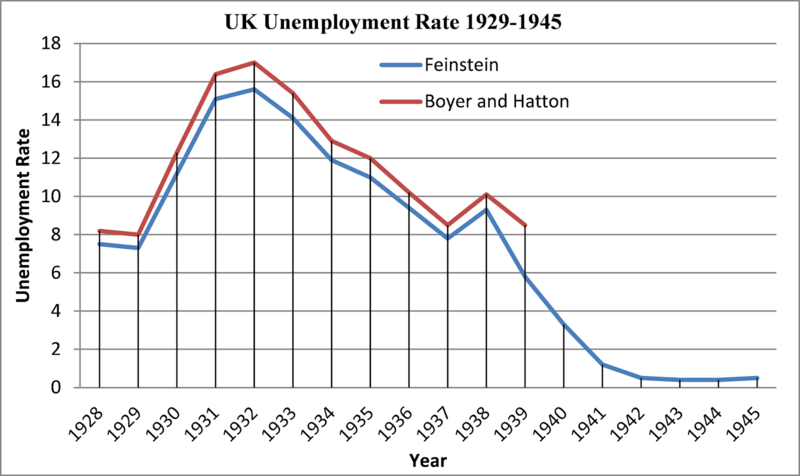 We can see the British unemployment rate in the graph below from 1928 to 1945, with figures both from Feinstein (quoted in Mitchell 1988: 124) and Boyer and Hatton (2002: 667). As we can see, British unemployment, although there was a falling trend, still remained very high through the 1930s down to 1938, the year before the war. 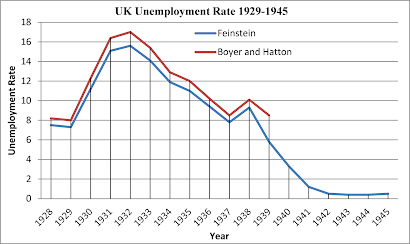 In 1938, unemployment still stood at 10.1% (by Boyer and Hatton’s calculations) or at 9.3% (by Feinstein’s calculations). In other words, even in 1938 there was terrible mass unemployment in Britain. Is it true that “Britain recovered faster than any other major economy”? Not at all. In fact, of the major economies both Japan and Germany had much better recoveries than Britain did – and certainly in terms of unemployment – because both nations turned to large-scale Keynesian fiscal stimulus (the evidence can be seen here and here, and one might add New Zealand to this list). The lesson is not that what Britain did was some highly effective cure for depression. That idea is utterly ludicrous. The conclusion is clearly: whatever Britain did was grossly inadequate and did not cure mass unemployment, the major consequence of the depression. Broadberry, S. N. 1984. “Fiscal Policy in Britain in the 1930s,” Economic History Review 37: 95–102. Middleton, Roger. 1981. “The Constant Employment Budget Balance and British Budgetary Policy, 1929–39,” Economic History Review 34: 266–286. Middleton, R. 1984. “The Measurement of Fiscal Influence in Britain in the 1930s,” Economic History Review 37: 103–106. It did once exist in Britain’s Conservative/Tory party, and here and there a few odd supporters can still be found amongst modern Conservative journalists/commentators, as I note here. In the past and recent past of the Tory party, both Harold Macmillan and Ian Gilmour seem to have been, broadly speaking, Keynesian Tories. But the use of Keynesian economics, or certainly full-employment Keynesian policy, has long since departed from Conservative government economic policy, just as it has – with the notable exception of about 2008–2010 – in New Labour. One of the few survivors of the old Tory party is Sir Peter Tapsell. Peter Oborne, “Sir Peter Tapsell: ‘My biggest mistake in politics was to listen to Mrs Thatcher,’” Telegraph, 21 March 2014. That seems to serve well as a requiem for UK Tory Keynesianism. In all the commentary, Yanis Varoufakis’ Post Keynesian connection seems to have been missed. Ben Chu, “Greece elections: Who are Syriza and what effect will their new government have on Europe?,” Independent, Monday 26 January 2015. The million dollar question is: will they eventually leave the Eurozone and what effect will that have on other EU nations where there are political parties gaining popularity that want to leave the EU too? Bill Mitchell has some sobering analysis here, and concludes that Syriza’s stated intention of staying within the EU is by no means radical and that its policy platform is deeply inconsistent. Barry Eichengreen speaks about his new book Hall of Mirrors: The Great Depression, the Great Recession and the Uses—and Misuses—of History (OUP USA, 2015). He also makes some interesting comments on the Eurozone early in the interview: the fetters of the Eurozone are worse than the gold standard! Yanis Varoufakis is interviewed below on his running in the coming Greek election for Syriza and the economic situation in Greece and the Euozone. The general legislative election in Greece will be held on 25 January 2015, and all eyes in Europe should be on this election, for it may well have profound consequences for the future of the Eurozone. But the mind simply boggles that Syriza says it is absolutely committed to remaining in the Eurozone. Perhaps they should take some advice from Bill Mitchell here, here, and here. Steve Keen is interviewed below by Lelde Smits for the Finance News Network. More details here. Steve Keen gives his assessment of the global economy as of January 2015 and predictions for 2015. His final comments on the Eurozone are very insightful: this may be the year one or some Eurozone nations break free of the euro. 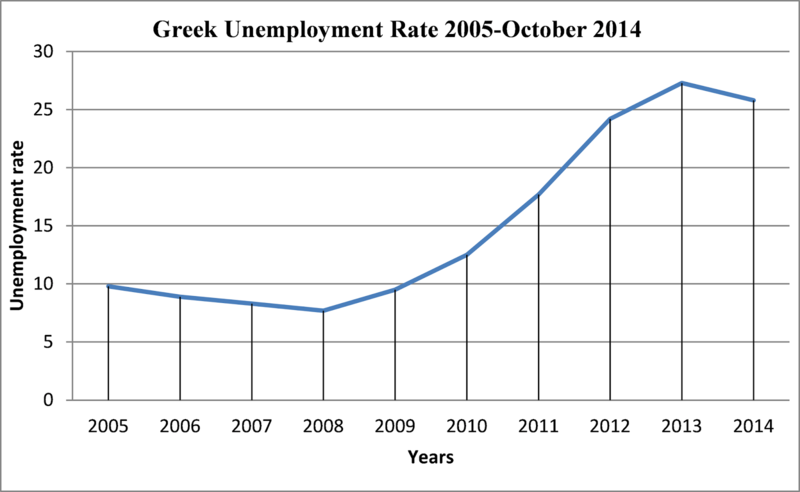 The graph below shows the unemployment rate in Greece from 2005 to 2014 (the data for 2005–2013 can be seen here, and the rate for October 2014 here). 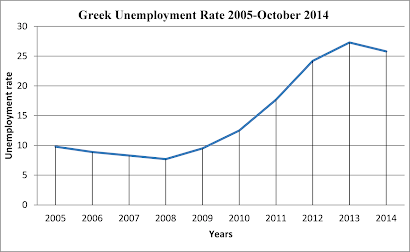 While it is true that unemployment was already moderately high in 2007, the consequences of remaining in the Eurozone and the austerity imposed on Greece have been devastating. The unemployment rate is worse than America’s in 1933 in the last year of the contractionary phase of the Great Depression (which was 24.9% as calculated in official BLS data). The social ills driven by the economic collapse are horrific, and include a huge surge in prostitution, drug use, and HIV and cuts in basic programs for health care and social services. With an election due in Greece on 25 January, it now seems that the anti-austerity left “Syriza” coalition might win government. It is unclear, however, what they will do if they win government. They do not even wish to leave the Eurozone, but have pledged to remain inside it. It seems unlikely they could possibly do anything substantive for Greece without leaving the Eurozone. But the broader implications of a Syriza win in Greece could be devastating for the future of the Eurozone, as noted here. It may well signal the beginning of electoral wins for parties that wish to leave the Eurozone completely such as the French Front National. In Britain, the UK Independence Party (UKIP) might do very well in the approaching election and split the Tory party. If a Tory-UKIP coalition formed government, the price would be taking the UK out of the EU. All in all, 2015 might well see another devastating crisis for the Eurozone. The late Old Labour politician Tony Benn speaks below on the European Union and why he believed that Britain should not be a member. It is mystifying to me why so many people on the left in Britain are so bent on defending the EU and keeping Britain in it. It is, first of all, a simple matter of democracy: why give up your sovereignty and democratic power to the EU and give away the power to change government policy on many substantive issues, when the EU is so clearly anti-democratic? Secondly, the EU is a neoliberal train wreck: it was designed on economically conservative ideas and the worst neoclassical economics. It was designed to be a monetary union without a powerful central fiscal authority: an unworkable and disastrous idea. The Eurozone has led to catastrophe on the fringes of Europe in Greece, Ireland, Italy, Spain and Portugal and Baltic states. In the larger states like Germany and France the situation is somewhat better, but hardly anything to boast of. If Britain had joined the Eurozone, it would have been a terrible mistake, and might today look something like Ireland. The evidence suggests that many members of the British public are highly sceptical of the EU and want a referendum on whether to remain in it. Tony Benn also speaks on UKIP in the video above. The UK Independence Party (UKIP) has recently taken advantage of the opposition to the EU and may do well in the 2015 general election that Britain will have in May of this year. UKIP is a curious movement. It is a right-wing party. It strongly opposes the EU and wishes to take the UK out of it; it also wishes to end mass immigration from the EU and replace it with a “points-based” immigration system as familiar from Canada, Australia or New Zealand. Many people, conservative voters especially, seem to be in favour of these policies (some evidence here and here). But on economics UKIP is essentially Thatcherite, perhaps worse than the Tories, and even more worryingly has a libertarian wing with all the extreme laissez faire nonsense familiar from American libertarians. The rise of UKIP is just another symptom of the utter bankruptcy of New Labour, especially on economics. It seems to me that a genuine leftist or Labour party in Britain should be opposed to the EU, on democratic and economic grounds alone. Finally, in honour of the late Tony Benn, who was a great social democrat, here is an old but lovely video of him tearing into Thatcherism. The ancient historian Philip Kay gives a talk in the video below on the economic history of the last centuries of the Roman Republic, given in London on 11th March, 2014. He is also author of the recent book Rome’s Economic Revolution (Oxford University Press, Oxford, 2014). Kay understands endogenous money and the role of fractional reserve banks in credit money creation. I have discussed the debt deflationary crisis of the Late Roman Republic here, an economic phenomenon which Kay seems only dimly aware of (at least in this talk) with respect to the financial crisis of 88 BC and the years that followed it. Though his work is somewhat old now, and he did not explicitly invoke debt deflation theory, nevertheless C. T. Barlow (1978 and 1980) years ago provided a very insightful analysis of the late Roman Republican economy in terms very close to modern debt deflationary dynamics. Barlow, C. T. 1978. Bankers, Moneylenders, and Interest Rates in the Roman Republic. Dissertation, University of North Carolina, Chapel Hill. No, not the late Christopher Hitchens, but his (gasp!) Conservative brother Peter Hitchens, in the video below. One wonders how many members of the current British Labour party would launch into such a passionate defence of the view that British railways should be nationalised again, with the notable exception of George Galloway. At one point (towards the end of the video), Hitchens’ Tory opponent says that the railways were built by private enterprise in the 19th century. That is true, but the private-sector construction of them involved remarkable waste in that railway overinvestment and oversupply occurred (Hutchison 1994: 225–226), and there were instances where this oversupply caused economic problems, especially when combined with railway stock becoming a speculative asset in stock market bubbles. When such bubbles burst, this affected the subsequent health of the railway sector and the economy at large. Yet another problem illustrating the inefficiency of the private sector was that different companies built different railway gauges, and when they met this naturally caused a great deal of inconvenience. This problem was resolved by government regulation in the 1846 Gauge of Railways Act. I am currently interested in the British political scene at the moment, in view of the general election that is due on 7 May, 2015. However, before I get to the main point below on the interesting British Conservative Peter Hitchens, some background is necessary. The post-World War II Keynesian consensus in Britain – which regarded full employment as a major aim of government economic policy – died an unfortunate death in the 1970s and 1980s. It was unfairly blamed for the stagflationary crisis of the 1970s (for evidence and arguments to support this, see here and here). 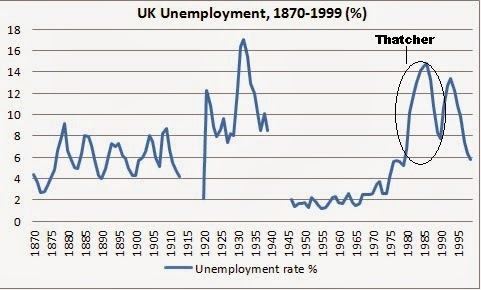 If one wants to look at the data on UK unemployment, to see how low it was in the golden age of the post-WWII era, one can see it below in the long-run graph of unemployment from 1870 to 1999. The data come from Boyer and Hatton (2002), but the graph simply omits unemployment statistics from the two World Wars. In the 1945 to mid-1970s era there was full employment. But it was not only the Labour party that engaged in responsible economic management in these years. The Conservative party deserves credit too. While one should not gloss over its limitations, nevertheless there was a perfectly respectable Conservative form of Keynesian economics in Britain after World War II, and the Conservative governments, by and large, also maintained full employment policies. While Thatcherism shattered Tory Keynesianism, even under the Iron Lady the Tories had their own fratricidal battles between the “Wets” and “Dries.” The former were old-style conservatives like Sir Ian Gilmour and Jim Prior who opposed Thatcher’s monetarism and more extreme free-market ideology. “Ian Gilmour, the liberal Conservative politician, Lord Gilmour of Craigmillar, … died aged 81, served briefly as Edward Heath’s defence secretary and for two years as lord privy seal under the less congenial leadership of Margaret Thatcher …. his reputation rests less upon his time in office than on his longer term opposition to Thatcher and Thatcherism. His background as proprietor (1954-67) and editor (1954-59) of the Spectator, and his books, made him a different kind of Tory. He was also one of the most consistent, and constructive opponents of Ricardian free market economics and their social consequences to be found in parliament. …. He first attracted attention with his purchase of the somnolent Spectator in 1954 .... Gilmour’s Spectator was humanitarian in social matters, anti-adventure in foreign affairs and Keynesian in economics. Are there any conservatives like this in Britain anymore? Could one, for example, find a British conservative in favour of a social democratic state, a “substantial” welfare system, “strong” employment rights, support for some revived form of council housing, and nationalisation of the railways? It would appear that one such unconventional conservative is Peter Hitchens, the brother of the late Christopher Hitchens. On economics, Peter Hitchens appears to be very unusual for someone who is generally reckoned to be a conservative. We can see this clearly in the video interview below where he elaborates on his economic ideas. The economic ideas here are remarkable from a modern British Conservative. Now no doubt many people on the left loath Peter Hitchens, and would jeer and sneer at him, for his various views: his conservative stand on religion, rather hard views on punishment of criminals, and support for the death penalty. I am not in favour of these things myself and am a person of the secular left, but it seems to me that the negative treatment Hitchens often receives from the left is grossly unfair, irrational, and infantile. The British left, for example, ought to be extremely concerned about the train wreck that is the EU, and leaving it may not be such a bad idea, if it continues to be such a disaster. Certainly adopting the Euro as a currency in Britain would be sheer madness. Even left-wing Modern Monetary Theory (MMT) economists regularly make the case that many peripheral European nations would be better off leaving the EU and Euro zone. But to return to Hitchens. He is an underrated conservative commentator and – whatever you think about his politics – he is highly eloquent, unconventional, and thought provoking, and well aware of how disillusioned the general British public is with their two main parties, which have no substantive differences on many issues. But now it is time for my main question. bashing both New Labour and the Tories in a way that would make an old-style social democrat’s heart swell). But the trouble here is the following: it is unclear how a government “heavily social democratic in social policy … that maintains a substantial welfare state” with “strong employment rights” is to be achieved. The fine details are missing. Is Peter Hitchens advocating Keynesian economics? Does he want to see a Britain with full employment again? The only effective economic theory for achieving anything like what Hitchens seems to want is Keynesian economic policy, the tried and tested system for successfully managing capitalist economies, which avoids the extreme errors and follies of Marxism and communism. As we saw above, Keynesianism used to be mainstream Conservative policy too. Furthermore, the feeble mainstream neoclassical version of Keynesianism is not up to the task, but it is Post Keynesian economics that is required. The crucial point is that – as far as I can see – unconventional conservatives like Hitchens just have not thought out their economic program. How are they going to respond to and refute the mainstream Conservative economists and Thatcherites who will tell them their economic program is unattainable and incompatible with neoclassical economic theory? That “strong employment rights” and “nationalisation of the railways” is contrary to (alleged) economic laws, wage flexibility, and so on and so forth? A look through the comments section of Hitchens’ column and the blogosphere shows that his economic program at times provokes strong attacks on him from libertarians and other conservatives of the laissez faire persuasion. This is not surprising because (even though the fine details are not clear) his economic ideas have their natural home on the left, not the right. How is he going to defend his economic ideas without a coherent economic theory? These are the questions that Conservatives who wish to return their party to a social democratic/Keynesian system need to think over very carefully indeed. This is not related to economics, but social commentary. We often hear from right-wing “tough-on-crime” types that the West is in some kind of moral crisis today. Many right-wing religious types blame the collapse of religion and traditional Christianity in the West for the alleged claim that crime has gotten out of control. So what do the statistics say on probably the worst crime possible: homicide. 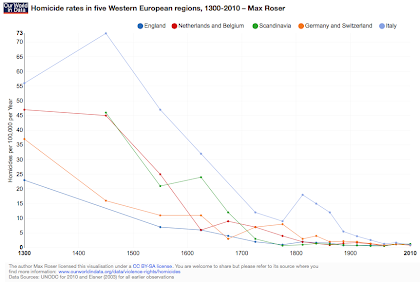 The following graph (which should be opened in a separate window) shows homicide rates in five Western European countries from 1300 to 2010, namely England, Netherlands, Belgium, Scandinavia, Germany, Switzerland and Italy. The data is compiled by Max Roser and can be seen here. 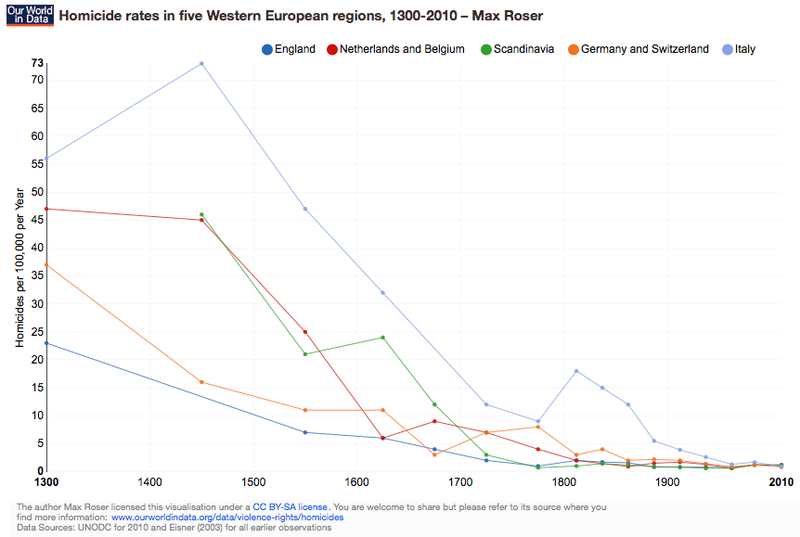 There is something utterly ridiculous about the right-wing narrative: in fact, there has been a long-run trend over many centuries in which homicide rates have plummeted. Even when religion came under attack from the 18th century Enlightenment and belief in religion at large collapsed from the 19th century and in the 20th century, homicide rates continued to fall. Our ancestors in the late Middle Ages and Early Modern Period were far more religious than we are, and by modern standards their societies were run along very conservative Christian lines, not only, say, with the death penalty for many crimes but also with some horrible and gruesome punishments for other (sometimes minor!) crimes, and even torture. Yet they were far more violent than we are. The idea that the collapse of Christianity has led to some profound moral crisis and historical rise in murder is a lot of nonsense. With the rise of non-belief and secularism, the homicide rate continued to fall. While it is true that in many nations there was a very mild rise in homicide rates from the late 1960s and 1970s, from a historical perspective this spike is so small as to be astonishingly trivial. Proof in the video debate below on gold, which involves Peter Schiff and Rick Rule (pro-gold) versus Marshall Auerback and Cullen Roche (anti-gold). But it is Peter Schiff’s comments here in the video clip below that represent a libertarian/Austrian economics myth that will not die. The Austrian school economist Jesús Huerta de Soto recently put his foot in his mouth and made a very similar but utterly wrong comment which I refute here. (2) real per capita GDP growth rate. The standard source for both modern real GDP and real per capita GDP growth rates in virtually every nation is Angus Maddison’s The World Economy: Historical Statistics (Paris, 2003). I have crunched the numbers on both real US GDP and per capita GDP growth rates (here and here). First, let us start with real US GDP. Because of an anomaly in Maddison’s data (as described here), it is best to give estimates from both Maddison’s and Balke and Gordon’s data. For real GDP averages below, I have also given an average calculated from Romer (1989) (the data can be seen here), even though Romer’s estimates are now generally regarded as inferior to those of Balke and Gordon. Unfortunately, annual estimates of GDP from 1866 to 1868 are not available, but we do have annual estimates for 1870 to 1914. Since the US suffered a recession in 1914 after the First World War started, I will remove this year from my estimates to make things better for advocates of the gold standard. As we can see, the 1870–1913 or 1871–1913 period was not “unmatched at any point in US economic history” in terms of economic growth. The largest GDP growth happened in America’s moderate command economy in World War II. Even putting wars aside, it was the recovery from the Great Depression from 1934–1940 under Roosevelt that had the highest average GDP growth rate at 6.511%. Next comes the Roaring ’20s (if we calculate this as 1922–1929) then the Reagan boom (1983–1989), and then the Golden Age of Capitalism if we reckon this as the 1950–1973 period. Only then does the 1870 to 1913 period occur in the ranking, and no matter what data you use. Schiff’s comments are clearly falsified by our best data, at least with reference to real GDP. But of course here an objection can be made: isn’t real per capita GDP a better way to measure real wealth in a nation, if we wish to gauge how wealth was increasing in relation to the population (that is, per capita or by head)? Yes, though one should also look at distribution of wealth issues too. But I will put aside the inequality and distribution of wealth issues to make it easier for the libertarians. Is the real per capita GDP data any better for the Austrians? No, it is worse. Admittedly, one should discount the WWII period, since the output of this period included mostly war production, not consumer goods. But even with the war discounted, the highest period of real per capita GDP growth was still the recovery from depression from 1934–1940, with an average real per capita GDP growth rate of 5.75%. Next comes the Roaring ’20s, the Reagan boom, the Golden Age of Capitalism (whether reckoned either as 1950–1973 or 1948–1973), and the neoliberal era (1974 to 2001). The gold standard era from 1871 to 1914 comes second last in the list, and is followed by the 1873 to 1896 deflationary period, which was the worst of all periods. Could the data be any clearer? The data that we have show us clearly that this is false. It is a libertarian/Austrian myth. What was that about if you repeat a lie enough times people will start to believe it? There is one difficulty in the data. (2) 1890 to 1914: from Kendrick 1961: 298–299 (with 1928 weights). It is obvious these are different from the growth rates calculated from data as it stands in Maddison for 1870 to 1890. Maddison has simply given the growth rate as 3.980% for all these years. It is unclear what the explanation is for this discrepancy. From 1890 to 1914, the growth rates calculated from Maddison’s data normally do not deviate too far from those calculated from Balke and Gordon (with a few exceptions). In view of this, I give GDP averages below for this period calculated from both Maddison’s and Balke and Gordon’s data. Average annual real GDP rate 1974–2001: 2.963%. The 1870 to 1913 period represents the Classical Gold Standard Era. The 1873 to 1896 era was the period of near continuous deflation in the late 19th century. The 1934 to 1940 period represents the recovery from the Great Depression under Roosevelt. The golden age of capitalism is usually taken to be from 1946–1973, but it is better to remove the immediate post-war years in which the economy was adjusting from a wartime command economy back to a peacetime economy in the anomalous recession that occurred from 1945–1947, so that we can reckon it as 1948–1973. Other economists actually reckon the “golden age of capitalism” as 1950–1973, so I have given this well for the sake of completeness. The neoliberal era can be given as 1974–2001, though admittedly it is not complete since Maddison’s data does not go beyond 2001. (11) Average annual real GDP rate 1974–2001: 2.963%. The highest average annual GDP growth rate in American history was actually during WWII, and of course this represented the huge surge in the production of war matériel. The second highest period was during the recovery under Roosevelt, who, as we know pursued a moderate Keynesian stimulus program. The third highest was, interestingly, the Roaring Twenties, if we calculate this as 1922–1929. The fourth highest was the boom under Reagan, whose economic policy was, despite the rhetoric, a type of Keynesianism, involving tax cuts and increased deficit spending. The fifth highest was the golden age of capitalism, if we calculate this as 1950 to 1973, the high tide of Keynesian economics in the United States. Next comes the gold standard era as calculated from Maddison or Balke and Gordon’s data, the era in which the US was rapidly industrialising. If one calculates the golden age of capitalism as 1948 to 1973 then this would be only slightly below 1871–1913. The next historical period was the great deflation from 1873–1896, which actually stands out as the second worst of the data. In the whole neoliberal era (the 1990s included but not data for 2002–2013) the average annual GDP growth rate slumped in a remarkable manner, which hardly bodes well for that period or the economic policies of most governments as they abandoned the full employment policies of the golden age. The data come from Historical Statistics of the United States: Colonial Times to 1970 (Washington, DC, 1975) (a discussion of the sources and reliability of the data can be found p. 1015). “The term ‘bank suspension’ has been defined to comprise all banks closed to the public, either temporarily or permanently, by supervisory authorities or by the banks’ boards of directors on account of financial difficulties, whether on a so-called moratorium basis or otherwise, unless the closing was under a special banking holiday declared by civil authorities. In the latter case, if the bank remained closed only during such holiday, it was not counted as a suspension. Banks which, without actually closing, merged with other banks or obtained agreements with depositors to waive or to defer withdrawal of a portion of their deposits likewise were not counted as suspended.” (U.S. Department of Commerce 1975: 1015). The graph is below (the data is from U.S. Department of Commerce 1975: 1038, Series X 741–755). The data are very good from 1921 onwards, but before this are often fragmentary and far less comprehensive. 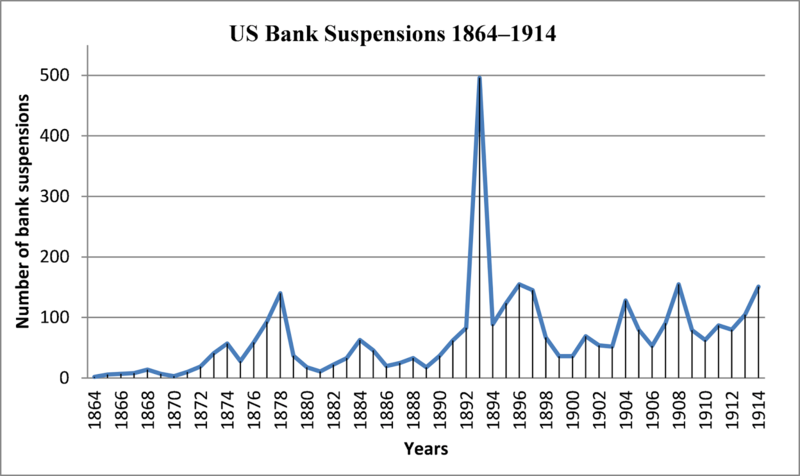 The further one goes back, the less complete is the data, so that for most of the 19th century the figures are useful only for gauging periods of bank distress and financial crisis, not for truly accurate and complete data on the actual number of suspensions in each year. That is, the data before about 1892 are far from being directly comparable to the data after this date, and even for 1892 to 1920 not completely comparable to the post-1921 data, even if much more reliable than pre-1892 data (U.S. Department of Commerce 1975: 1015). Despite these caveats, the data are very interesting indeed. It is better to break the graph up into smaller ones to see the trends better. 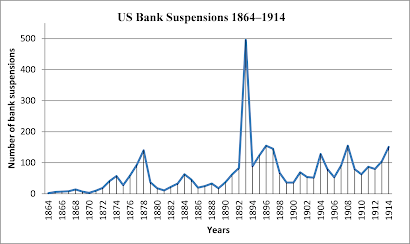 First, we can look at bank suspensions from 1864 to 1914 in the graph below. The rising bank failures in the 1870s coincides with the economic distress and problems of these years, and the surge in failures in 1893 is not surprising given the financial crisis in that year. 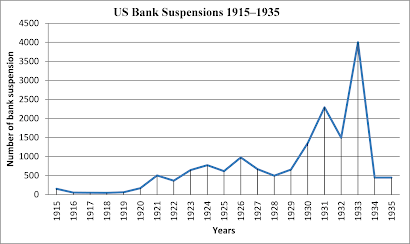 Next, we can look at the graph of bank suspensions from 1915 to 1935 below. The 1929–1933 years were a period of utter catastrophe, in which thousands of US banks, especially large ones, failed, destroying the life savings and deposits of millions of Americans. This was one of many reasons why the depression was so bad, and the Federal Reserve was grossly incompetent in allowing so many banks to fail. What is also interesting is that there was a surge in bank failures in the 1920 to 1921 recession but it was clearly nowhere near as bad as the 1929–1933 crisis years. (U.S. Department of Commerce 1975: 1038). In 1920 to 1921 there seems to be some evidence that many banks that failed then were actually small rural banks, so that macroeconomic effects of these failures were not as great as the raw numbers suggest. Furthermore, the standard lender of last resort facility at the Fed via discounting policy proved sufficient to avert a mass panic and bank runs. By contrast, in 1929–1933 much more radical intervention was required by the Fed but not forthcoming. 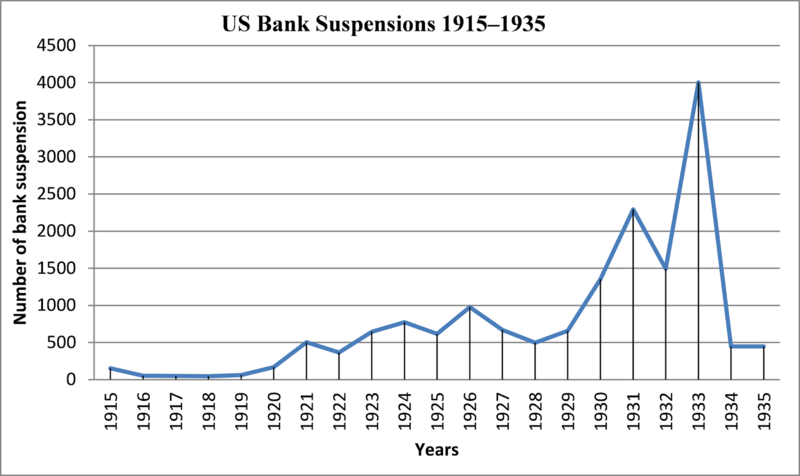 It is also puzzling why there was a rising trend in bank failures during the Roaring Twenties from 1923 to 1926. The explanation here is that, as in 1920 to 1921, many small rural banks failed in the 1920s as agricultural commodity prices plunged. Many banks had lent to farmers and agricultural producers in WWI, but as farm revenues fell in the 1920s and many farmers defaulted on loans and foreclosures mounted, many rural banks also failed (Thomas 1997: 381–382). The crucial point here, then, is that most of the banks that failed in the 1920s were small rural banks with relatively small total deposits and so the macroeconomic effects of these failures were also small (Fuller 2011: 12). 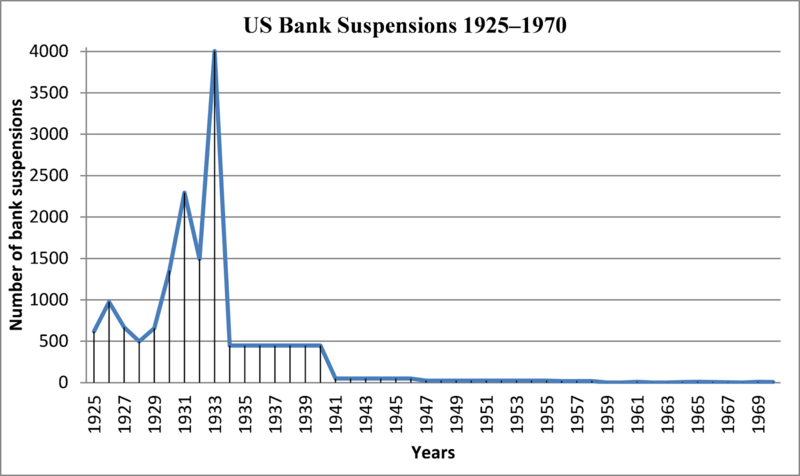 Finally, we can see a graph of bank suspensions from 1925 to 1970 in the graph below. 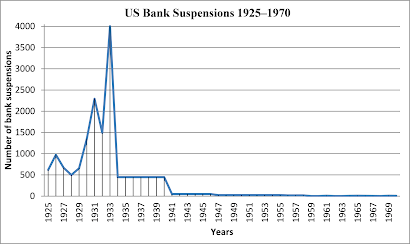 It should be noted that for the 1934 to 1940 period the total number of suspensions in these years seems to be 448 (U.S. Department of Commerce 1975: 1038), but it is difficult to indicate this in the graph, so I have been reduced to giving 448 as the value in each year from 1934 to 1940 (a misleading but quick solution I found). Likewise, the total number of suspensions from 1941 to 1946 was 49, but I have given 49 as the value in each of these years. At any rate, once the Federal Reserve really started acting as an effective lender of last resort, federal deposit insurance was instituted, and banks were subject to an effective system of financial regulation, the numbers of failures plummeted. 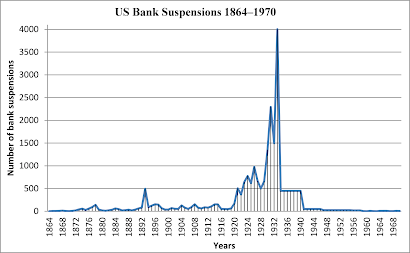 By the late 1950s, less than 10 bank failures each year usually occurred, and even then deposits were protected and not lost, as in previous eras. This is yet another reason why the golden age of capitalism was an unprecedented era of prosperity and stability. Fuller, Robert Lynn. 2011. Phantom of Fear: The Banking Panic of 1933. McFarland & Company, Inc., Jefferson. Thomas, Lloyd B. 1997. Money, Banking, and Financial Markets. McGraw-Hill Companies, Boston, Mass and New York. U.S. Department of Commerce. 1975. Historical Statistics of the United States: Colonial Times to 1970. U.S. Government Printing Office, Washington, DC. Neoclassical economists have various explanations for the 1873–1896 deflationary period, and usually using the quantity theory of money. Neoclassicals generally think that the 1873–1896 era in Britain, though there was a severe contraction of some agricultural activity, was mainly a fall in nominal, not real values (Capie and Wood 1997: 287). The traditional view before this was that the period had been one of depression, but this had become discredited by the 1960s (Saul 1969; Crafts, Leybourne and Mills 1989), in view of the data that real output did in fact continue to increase in the long-run. The UK broad money supply grew at an average annual growth rate of about 1.3% a year from 1873 to 1896 and at about 2% from 1897 to 1913, with money supply in total growing by 33% by 1896 as compared with 1873 and real output by 53% in that same period (Capie and Wood 1997: 287). Even John Maynard Keynes in A Treatise on Money (volume 2; 1930: 164–170, 198–208) adhered to a quantity theory explanation of most of this period (at a time when he was of course both a Wicksellian and an advocate of the quantity theory). Keynes thought that falling production of gold and rising demand for it in the 1873 to 1886 period was the fundamental cause of the deflation in these years (Keynes 1930 164–165). However, he also thought that gold supply rose sufficiently from about 1886 to 1896 and at the same time that there was an “ease of credit” (Keynes 1930 165), so that the price deflation of these years was caused by saving exceeding investment. Modern Post Keynesians say that the quantity theory is not true for modern advanced capitalist economies, where money is largely endogenous. Is this true for the 19th century? (3) the direction of causation as assumed in the quantity theory equation is from left to right (that is, from the money supply to the price level). That is to say, an exogenously-determined money supply that is the fundamental cause, or driver, of price level changes. The supply of gold which functioned as a monetary base was exogenously determined, and in the 1873–late 1880s period its growth rate seems to have fallen. Yet at the same time the Bank of England did print its own banknotes as limited by Bank Charter Act of 1844. Although the 1844 Bank Charter Act had imposed a legal constraint on the Bank of England to issue banknotes as against gold, in practice that legal restraint was suspended in times of financial crisis (Glasner 1997: 32). Although I do not have precise data at hand, it would seem that Bank of England banknotes functioned as close substitute for gold and so augmented the gold supply that acted as a monetary base, and it would also seem that the role of gold actually fell in the late 19th century as demand deposits and banknotes became the largest form of money. Demand deposit money was endogenous to a significant degree, and to the extent that they were not limited by the Bank Charter Act of 1844 Bank of England banknotes were presumably endogenous to some degree was well. At best, then, the truth of assumption (1) is questionable. Assumption (2) is not credible, even in the 19th century. Assumption (3) may have been true to the extent that exogenous gold supply could drive inflation, but one would suspect that direction of causation was reversed with respect to endogenous credit money in the 19th century too. All in all, the orthodox quantity theory of money explanation of the 1873 to 1896 looks dubious. If an inelastic supply of gold imposed constraints on growth in this period, it would have been by reducing the ability of business people to obtain credit. I am undecided on what the primary cause of the deflation of this era was. But, if the primary cause of the price deflation of the 1873–1896 era was price reductions caused by positive supply factors and technological advances reducing prices, then it is likely that the lower money supply growth of that same era was partly the result of the falling prices, given that money supply was partly endogenous. Finally, yet another explanation in mainstream economics is that the 1873 to 1896 period was part of a “Kondratieff cycle” (or “Kondratieff wave), a supposed phenomenon in which long-run cycles of expansions and contraction of about 40 to 60 years affect capitalist economies. If a “Kondratieff cycle” contraction is assumed to be a continuous period of recession, then it is obvious that 1873–1896 was not a Kondratieff cycle, and this view had fallen into disrepute (Capie and Wood 1997: 288). However, other economists define a “Kondratieff cycle” downturn as a period not of continuous recession, but of overcapacity where supply exceeds demand. If a “Kondratieff cycle” is defined in this looser way, then 1873–1896 might possibly be interpreted in this way (see, for example, Bortis 2013: 346), though it is highly dubious that modern capitalism really is prone to regular “Kondratieff cycles” even in this sense. Bortis, Heinrich. 2013. “Post-Keynesian Principles and Economic Policies,” in G. C. Harcourt and Peter Kriesler (eds. ), The Oxford Handbook of Post-Keynesian Economics. Volume 2: Critiques and Methodology. Oxford University Press, New York. 326–390. Bordo, M. D. and Schwartz, A. J. 1981. “Money and Prices in the 19th Century: Was Thomas Tooke Right?,” Explorations in Economic History 18: 97–127. Cagan, Phillip. 1965. Determinants and Effects of Changes in the Stock of Money: 1875–1960. Columbia U.P. New York and London. Capie, Forrest H. and G. E. Wood. 1997. “Great Depression of 1873–1896,” in D. Glasner and T. F. Cooley (eds). Business Cycles and Depressions: An Encyclopedia, Garland Pub., New York. 287–288. Capie, Forrest H., Mills, T. C. and G. E. Wood. 1991. “Money, Interest Rates and the Great Depression: Britain from 1870 to 1913,” in James Foreman-Peck (ed. ), New Perspectives on the Late Victorian Economy: Essays in Quantitative Economic History, 1860–1914. Cambridge University Press, Cambridge. 251–284. Capie, Forrest H. and Alan Webber. 1985. A Monetary History of the United Kingdom, 1870–1982. Volume 1. Data, Sources, Methods. George Allen & Unwin, London. Crafts, N. F. R., Leybourne, S. J. and Mills, T. C. 1989. “The Climacteric in Late Victorian Britain and France: A Reappraisal of the Evidence,” Journal of Applied Econometrics 4: 103–117. Glasner, David. 1997. “Bank Charter Act of 1844,” in D. Glasner and T. F. Cooley (eds). Business Cycles and Depressions: An Encyclopedia. Garland Publishing, New York. 31–33. Keynes, John Maynard. 1930. A Treatise on Money. Volume 2. The Applied Theory of Money. Macmillan, London. Saul, S. B. 1969. The Myth of the Great Depression, 1873–1896 (1st edn. ), Macmillan, London. Around about 1884 to 1886 many Western nations experienced recession, and this was in the midst of the extended price deflation that occurred from 1873 to 1896. America seems to have had a recession too in the years around 1888, and in 1886 the newly-established US Bureau of Labor (which was founded in 1884) issued a report called Industrial Depressions. The First Annual Report of the Commissioner of Labor, March, 1886, which looked into the recession and current economic conditions. “One of the agents of the Bureau reports as the result of interviews had with leading economists in Europe the following as the predominant features of modem industrial development among the producing nations: (1) The influence of the increased facilities for transportation and international communication. (2) The steady progress of rising wages, contemporaneous with declining profits. (3) The enlargement of the circle of producing nations to such extent as to make the means of production far in excess of the needs of consumption.” (Industrial Depressions. The First Annual Report of the Commissioner of Labor, March, 1886, pp. 258). So the “profit deflation” or profit squeeze that British business people were complaining about (the evidence for which can be read here, here, and here) seems not to have been restricted only to Britain. M. Piermez, a thoughtful Belgian banker and public man, in an examination of the present economic situation, asks the questions: ‘(1) Are we in the face of a general diminution of wealth? (2) Or is there only a change in its distribution?’ Answering the first in the negative, he proceeds to show how the distribution has been modified so as to give a proportion of revenue relatively less to land and capital and greater to labor. Capital has greatly increased and will continue to increase, but probably not in such a rapid progress as heretofore and chiefly for these reasons: ‘(1) It is not likely that there will be again an economic progress comparable to that by which this century has changed the face of the whole world. (2) The accumulation of savings will tend to diminish in proportion as they are rendered less and less productive. (3) The lower classes, whose share in the world’s distribution of wealth will continue to increase, save less than the upper classes. The average well-being of society increases with increase of wealth, and in the partition of this well-being a continually smaller share will go to those who live by wealth already acquired and a greater share to those who work. It will be still more difficult than it is to-day to live without working. Side by side with the fact of the increased reward of the wage-earner must be placed the great advance in the purchasing power of his wages. All the necessaries of life, food, clothing, heating, and lighting have been cheapened, and the tendency is for them to become cheaper still, that is, unless, in the case of the first-named article, the tariffs recently imposed in some European countries, Germany and France especially, the cost of food should remain normal or ascend. Laborers are feeling the effects of higher wages by eating more, clothing themselves better, and lodging in more wholesome houses. This, in return, reacts in making their labor more efficient and enables them to gain still more.” (Industrial Depressions. The First Annual Report of the Commissioner of Labor, March, 1886, pp. 260–261). Industrial Depressions. The First Annual Report of the Commissioner of Labor, March, 1886. Government Printing Office, Washington, 1886.